OK seems like we´ve done loads since our last blog so just bear with us if this seems like a long one! Left Valparaiso for La Serena which involved a whole day on a bus but we were quite eager to get up through Chile as quickly as possible to cheaper countries. La Serena was a lovely city and it was here that we started to really settle into South American travelling and start to enjoy ourselves. One particular activity which sticks in our minds was the decision to hire bikes for a nice leisurely ride along the beach. Unfortunately we chose a man under a sun umbrella on the beach to hire them off and this resulted in some pretty dodgy bikes, especially Becca´s which resembled a little girls toy bike and was stuck on the lowest gear so she had to peddle about 10 times to every one of ours, something Hannah and Laura never tired of laughing at, Becca, however, still doesn't like to talk about this experience as it was 2 hours of humiliation and extreme arse pain. La Serena is on the coast next to the Elqui Valley which we´d been told was beautiful so we decided to spend a day visiting it. We decided to take a guided tour so we wouldn't have to think about what we were doing for the day. This worked out well as it was also a great way to find other English speaking people to talk to (which we had been quite deprived of) but our guide did seem to have a fascination with agriculture, particularly avocados which he stopped the bus many a time to point out to us, as well as to describe each particular micro-climate. We found it quite difficult to appear interested in this throughout the whole day and were very relieved when he took us to a pisco (a very strong Chilean Brandy) distillery which was much more our scene, especially since we got to taste all the alcohol. For lunch we were taken to a café high in the mountains where the food was cooked completely by solar energy- sounds hi-tech but really this consisted of glass cabinets with mirrors underneath pointing at the sun. That night we caught an 18 hour overnight bus to San Pedro which is right in the north of Chile on the Bolivian border, in the middle of the driest desert in the world. The bus journey itself was stunning as we came over the Andes and into the desert. San Pedro was a lot smaller than we expected but was a bit of a travelers haven which was great for us and straight away we metsome really nice people. One of the girls, Cara, who we met whilst looking for a hostel, we got on particularly well with and we have been travelling together for the last week. The hostel we stayed in reminded us of Amed in Bali where everyone who worked there was really friendly and wanted to make sure we were having a good time all the time (just as well considering Laura nearly blew up the kitchen trying to light the gas stove on the first night). They recommended us to do a walk to some caves and ruins about 2kms (it seemed a lot further!) from the town. So off we went trekking into the desert at 1 oclock in the afternoon- not our most intelligent of plans considering we didn't really know where we were going and underestimated the effects of the altitude (San Pedro´s at about 2500ms). Little did we know this was nothing compared to what we were going to be facing in the next few days. Luckily we were offered a lift in the back of a Chilean couple´s pickup truck on the way back otherwise we may never have made it back. That night we had booked ourselves in to do a star gazing evening. This was absolutely amazing and a lot cooler than we expected. We were shown the night sky by a very knowledgeable and cool French guy named Alain who attempted to pass on his knowledge and teach us about all the constellations and the physics behind the night sky. We got to look through about 10 different telescopes including one which was focused on Saturn and although without a telescope it looked just like a normal star, when we looked through it was so perfect it looked almost like a sticker on the lens of the telescope. He bombarded us with information, not much of which we can remember to pass on now but was still a really interesting night. We booked a 3 day jeep tour over the border and into the Bolivian salt flats for the next day. This was something we were all really excited about because we´d heard so many good things about it and it didn't disappoint. We did have a minor setback on the Chilean border when Laura appeared to have lost her entry card into the country. After a pretty major panic when Laura told the guide and he replied with only ´´mucho problemo´´, definitely not what she wanted to hear, all was well and she was allowed into the country, without even having to bribe anyone. Turned out the customs guy was quite slack and didn't really care that much. After driving for 45 minutes we reached Bolivian immigration where we were separated into groups of 6 in different jeeps. As well as us 3 and Cara we met up with a Dutch girl called Sophie who Cara had met along her travels and who became another one of our travelling party for the next week or so. The last member of our group didn't fit in quite so well. Enter Quentin from New Zealand who was definitely an interesting character. At first we felt sorry for him being shoved with us 5 girls who were all nattering away the whole time but after a while he became so irritating that our sympathy wavered. Our guides had typical Bolivian names, Jimmy and Edgar. We found this pretty funny as neither of them spoke a word of English. They were lovely though and looked after us really well. Over the course of the first day we say 3 different lakes, each more impressive than the last and in a variety of colours- green, white and red. Also saw some geysers which were at about 4280m so needless to say it was bloody cold and as you might have seen from the photographs we had come prepared and were all docked out in wooly items and wore all our clothes for the duration of our trip. Much to Sophie´s excitement in particular the last lake we got to was home to 3 different species of flamingos so that night after being dropped at our accommodation we walked out to the lake to watch the beautiful sunset over the pink lake with the pink flamingos. There were also many llamas dotted about which we later learnt was nothing special as wild llamas are all over the Bolivian desert but we were very excited to see them and loved them all the same. That night was definitely a chilly one with our water bottles (and cans of beer) freezing to solid ice and temperatures outside down to -15 degrees. After a pretty sleepless night thanks to altitude, cold and Quentin´s snoring we were up at 7 the next day to continue the journey across the desert. Most of this day was spent driving, only stopping at some unusually shaped rock formations (more exciting than they sound), another lake where we had lunch and to be dumped at the side of the road as Jimmy tried to navigate the jeep over the rocky terrain as we walked down the hill. That night we stayed at the salt hotel which was very exciting until we realized it had cracks in the walls and it turns out salt isn't a very good insulator. We did have a hot shower though which was very much appreciated after 2 days of wearing the same 10 layers of clothes each. After some card games we got a very early night as Jimmy told us with a smirk on his face that we had to be up at 5 the next morning. We resented this early start until we got out onto the salt flats the next morning where we were dropped by a mountain in the middle of the flats which was covered in cacti. We reached the top just in time to see the sun rise over the salt desert which is one of the most beautiful sites any of us had ever seen. We stayed up there for a good hour just taking photo after photo and enjoying the view. Was definitely one of our favourite moments of the trip so far. As if it couldn't get any better, as we climbed down the mountain we were presented with cake and hot chocolate for breakfast- good old Edgar! After that we entertained ourselves for another couple of hours by taking lots of perspective photos which are actually rather difficult to compose as we learnt from the giant chocolate biscuit photo which Becca wanted which led to Laura lying on her front on the salt for about half an hour! We did get some great photos though and make sure you check them out in the new photo album. 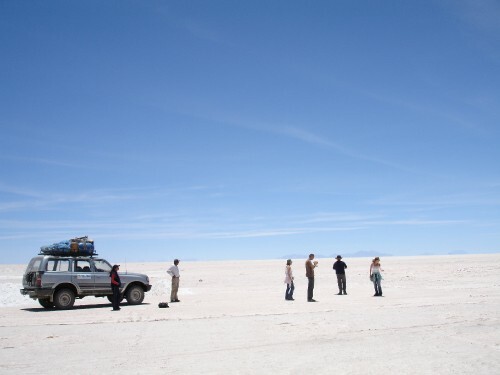 From then we made our way over the salt towards Uyuni which is a pretty non-discript town which is basically just the gateway to the salt. It did, however, house a train graveyard which we were taken to which included the oldest train in Bolivia- wow. After llama for lunch and meeting Edgar´s son Dennis (seriously) we were dropped at our hostel and spent the rest of the day wandering round the town with Cara and Sophie and doing a spot of shopping, mainly for woolen goodies with llamas on. Got the bus to Sucre the next morning. This was a very, very long journey (think we´re going to have to get used to them in south America!). Sucre was a really nice city built on a hill with all the buildings painted white. Met 2 Swedish guys on the bus so the 7 of us ended up getting a dorm together and that night we went out for our long overdue first night out in South America. Went for a meal in a really cool little restaurant which we all really enjoyed apart from Becca whose Spanish caused more problems when she thought she´d ordered an Enchilada and was instead presented with Ensalada- salad. She really was not impressed and ate it very begrudgingly. The next day Sophie was very keen on visiting a market which we thought was just outside Sucre so we embarked on a day out which lasted all of one hour during which we walked about 10 miles in the heat to get to a bus station which didn't run any buses, were then directed to a different bus whose driver we think was pretty new to the job as he blatantly had no clue where he was going and all the passengers were shouting at him where to go. It also didn't help that half the streets were barricaded off due to a cycling race which resulted in a very scary 20 point turn of the bus down a ridiculously narrow side street. 15 minutes later we ended up back where we´d started and decided to swiftly exit the bus and give up on our market mission and instead go to the nearby bakery for some empanadas. Later on that day we found a really nice café (Café Mirador) on one of the hillsides overlooking the city where we whiled away the afternoon in the sunshine. That night we had an international card session with players from England, Ireland, Sweden and Holland on the roof of our hostel- great fun. Our last day in Sucre was spent sunbathing on the roof (in Hannah´s case getting really sunburnt) before boarding our next overnight bus to La Paz. This turned out to be a bit stressful. Bus stations in Bolivia don't do things the way you might expect, when we tried to load our bags onto our bus we were directed up 2 flights of stairs from where our bags were lowered by a winch back down to the original platform. We´re yet to work out why they think this system is practical- our Spanish hasn't really got to that stage yet. We were, however, delighted to hear that we´d been upgraded to a first class bus (we did manage to understand that) which was amazingly comfortable but didn't provide us with the good nights sleep we´d hoped due to an unclosable window blasting cold air into our face. Our first impressions of La Paz, despite our exhaustion, are good and seems like it´s going to be an interesting place to spend a few days with lots going on. After catching up on some sleep we went for a wander this morning and got horribly horribly lost. We also decided a wash was due since we haven't done one since Auckland, we disgust ourselves, so we put in 13kg of washing, the woman seemed a bit overwhelmed as the carrier bags of dirty washing kept appearing. We´ve spent the afternoon getting a feel for the city and tomorrow we are going to do a bit of culture and have a look at the museums then we´re meeting up with Sophie and her Dutch friend for some partying.